Most people think "small bathroom," and they think cramped shower stalls, dim lighting, and vanities stuffed to the gills. And while a small bathroom may mean making a few sacrifices on space, it can also be welcoming and comfortable. Plus, the major pros of a small bathroom? With less square footage to deal with, it's cheaper to renovate, faster to clean and easier to decorate. 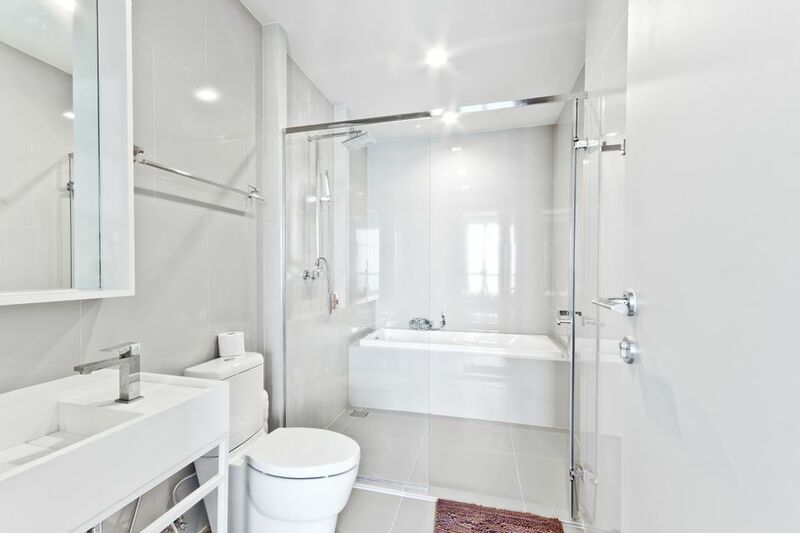 If you're considering renovating your small bathroom, there are many ways to create the illusion of more space while maximizing what you have. 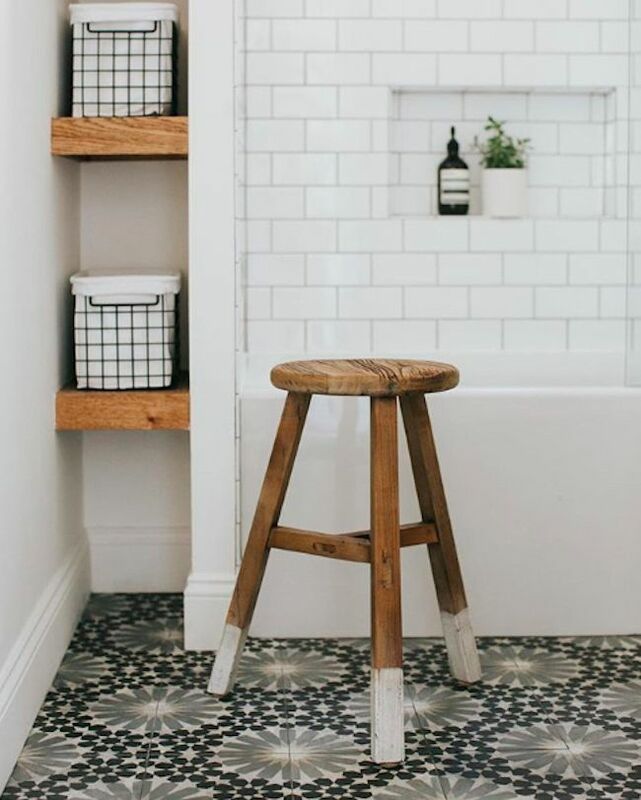 From cozy shelving nooks, like the one seen in this space from katiemonkhouseinteriors, to strategically placed clawfoot tubs, we've rounded up the best designs for a small bathroom. One of the best aspects of modern, contemporary design is the seamless, clean lines that create an open and airy feel. This updated bathroom from OneKindesign feels much bigger than it actually is, in part because the eye is drawn to the crisp, straight lines of the vanity, which elongate the room and almost seem to push the walls out. Neutral colors like white and unpainted wood are also great choices for small bathrooms. Adding wainscoting to your bathroom creates a more classic look and lends a bit of visual interest. For a more design-forward approach, invest in a graphic wallpaper, like this tropical one seen on Design Sponge. By keeping the wainscoting white and neutral, the bold print adds a pop of personality without overwhelming the small space. The white pedestal sink not only uses less floor space than a large vanity but also blends in with the paneling to create an optical illusion of more space. If you want a wainscoting alternative, shiplap can be a great choice in small bathrooms. This cozy bathroom from Keys to Inspiration uses horizontal shiplap to break up the wall space. The lines also appear to visually extend the wall and make it feel wider than it really is. Think a lack of bathroom square footage means you have to forgo a luxury tub? Think again. This enviable bathroom from the_styling_edge features a deep soaking tub that's strategically placed to fit just perfectly inside the small nook. Though the space is heavy on patterns—with a bold tiled floor and a large art print—the simple black and white palette ensure it remains balanced. If you dream of a standalone shower and a clawfoot tub, this cozy bathroom from Hometalk is the perfect inspiration for your next renovation. By replacing a standard shower curtain with a glass door panel, the bathroom feels more open. The frosted glass windows allow precious natural light in (a small space's favorite accessory! ), without sacrificing privacy. If your small bathroom is bursting with anything, let it be a personality (rather than stray makeup and toiletries). We love this girly, floral bathroom from At Home With Ashley that uses a vintage-inspired wallpaper to add pops of color to an otherwise neutral white space. While wallpaper can be expensive, one benefit of a small space is that you won't need to purchase much in order to make a big statement. We've said it before, but natural light can make even the tiniest bathroom feel spacious and open. This attic bathroom seen on tim_scrbg's Instagram may be short on ceiling space, but the slanted window creates an inviting and surprisingly roomy feel. Bonus points for the clever under-the-pedestal storage, which makes use of vital, often forgotten space. If you can live without it, forgoing a tub is a great way to earn back precious floor space and open up a small bathroom. We love the glass shower stall seen in this bathroom from House of Jade and the use of mixed tiles on the floor and walls, which add a sense of variety and eclecticism despite the tiny footprint. This candy-colored bathroom from decoracaocriativa is everything we love about small spaces—it's unique, creative and welcoming. Though neutral colors can provide a calming backdrop, this bubblegum pink bathroom is incredibly fun, and the single color palette keeps it from becoming overpowering. A galley bathroom can feel claustrophobic if not designed correctly, but this one from The Creativity Exchange proves that with the right layout, it can feel downright spacious. The double vanity and glass shower stall keeps the space open and visually elongates the room. When it comes to small spaces, "hygge" is everything right now. This Danish concept that encompasses all that we love about a comfortable, warm-feeling design is perfect for cozy spaces. We love this Scandinavian bathroom from Apartment 34 because it's functional and uniquely laid out. The tucked away shower makes the rest of the room feel far more spacious and open. One of the biggest downsides of a small bathroom is, of course, finding a place to hide all of your stuff. Storage in a small bathroom will require a bit of creativity. This bathroom from The Mama Notes may not have the luxury of endless storage, but a ladder shelf provides the perfect place for towels, bath supplies, and other knickknacks. This moody bathroom from Claire Brody Designs has stunning black accents that work in tandem with the light tiled floors and neutral wallpaper to add depth to the room (without feeling too dark). Black paint may take some guts to incorporate into your decor, but the payoff is worth it. Subway tile is an excellent choice for any bathroom. But when designing a small bathroom, consider a larger tile like the ones seen in this bathroom from audreycrispinteriors. The large tilework creates the illusion of higher, wider ceilings, and works perfectly with the neutral wood accents. It also pairs beautifully with the subtle touches of greenery utilized here. 20 Bathroom Decorating Ideas You'll Fall In Love With!